People honor this day as the Equinox (meaning even day, i.e. the length of the day equals the length of the night). Water also gets colder and people should not bathe in waters in the open. That day, people do not eat black grapes or any fruit, begetable or drink of red color (associated with the blood of the saint), and to chase away sickness they eat white grapes and drink white wine. Aged people in the eastern regions tell the story that on Seknovenie Day all snakes, lizards and other reptiles return to their winter holes with the snake king. “Wood-nymphs, fairies, dragons and dragonesses go to the end of the world”, and prepare for the winter. You must not start any new jobs on this day. Women do not cut fabrics or sew because it is believed that the dress cut or sown that day is “black” and brings bad luck. The same refers to everything black, so people, unless in mourning, must not wear black clothes that day. 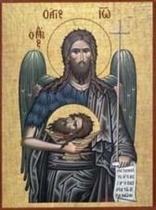 John the Baptist was a cousin of the Holy Virgin Mary. He was born when his mother was advanced in age, after the foretelling of his birth and the choice of his name by an angel. He began his mission of preaching and baptizing in the river Jordan at about 27 AD. His way of life closely resembled those of some Old Testament prophets, such as Elias. His message was one of repentance and preparation for the coming of the Messiah and His Kingdom. The Apostles St. Peter and St. Andrew were among his disciples. John baptized Jesus and recognized Him as the Messiah, when he saw the Spirit come down on Him. John also denounced the incestuous relationship of King Herod Antipas with his niece and brothers wife, Herodias, and was imprisoned for doing so. His death was brought about by the hatred of Herodias and the weakness of King Herod. When Salome, her daughter, had greatly pleased Herod with her dancing, he promised her anything she wanted. She demanded Johns head on a dish. The executioner Machaeus beheaded John and presented his head to Salome, who passed it on to her mother. John the Baptist was believed to be buried in Samaria where he was honored in the 4th century. The death of the Prophet, Forerunner, and Baptist is remembered on 29th August, and the Church keeps a strict fast on this day.